Whether you’re counting carbs or calorie calculating, maybe it’s time to quit. While keeping a food journal can be quite important and learning which foods aren’t healthy or excessively fattening is good, maybe focusing on calorie counting isn’t. There’s a better way to do it. That’s by focusing more on eating healthy rather than how many calories food contains. Quality over quantity is always best, but sometimes you can have both. Eating healthy focuses on consuming whole foods that are packed with nutrients. Fresh vegetables, lean meat and whole grains are far better than processed foods and loads of sugar. One hundred calories from a baked good is not nearly as good as 100 calories from fresh vegetables or fruit. Besides the vitamins and minerals the vegetables contain, it also contains fiber, which your body requires. 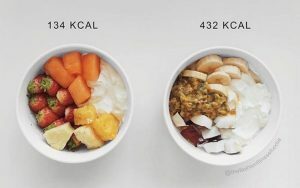 If you set the two side by side, the serving size for a 100 calories of vegetables would be far bigger and more filling. You get both quality and quantity. Counting calories can lead to overdoing it. Some people start counting calories with good intentions, but then their competitive, overachiever sets in and they cut those calories lower and lower. Before you know it, they’re eating a super low calories diet. That’s counterproductive to shedding pounds. Your body requires a certain number of calories or it will go into starvation mode that slows the metabolism to protect the most important organs and processes. It’s far easier to simply avoid processed foods and learn healthy eating techniques. While learning healthy eating may take longer and you’ll constantly be learning, it’s far easier than looking up every food to see the number of calories or trying to figure out just how many calories a main course or side dish has based on the ingredients it contains. You can eat anywhere and it starts to become just a natural act when you focus on healthy eating rather than on calories or carbs. Adding regular exercise to a plan of healthy eating can boost weight loss, while making you feel and look great. You’ll burn off stress and tone your muscles, while burning calories at the same time. If you count calories, you also need to know how much nutrition you get from the food so you stay healthy. Trying to balance calorie counting with fiber, protein, fat, carb and nutrient content becomes almost impossible. Calorie counting can provide false information. Processed foods have calories that our body may be more readily absorbed, while healthy food doesn’t. One study showed that only 80 percent of the calories in almonds were absorbed. It’s important to learn to eat only when you’re hungry, chew and slow down food consumption and if you eat something unhealthy, it’s not the end of the world. Get back on the healthy eating wagon.